I’ve been trying today to get Helen’s quilt top finished, but it’s not going to happen today, I’ve got myself into a slight pickle with it which will need a fresh head to sort out, not a midnight head!! I’ve been hand-sewing all the tails, eyes and little spikes of hair today. I decided to use perle thread as it’s a decent weight and I also happen to have a box full of lovely colours! 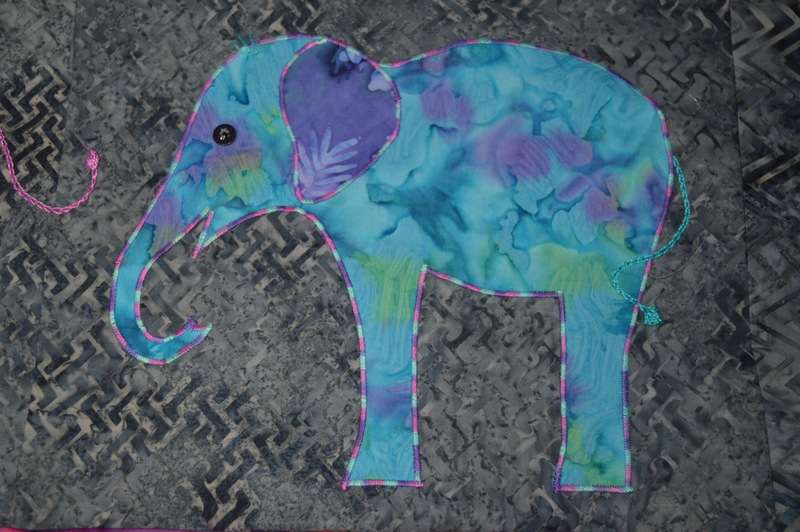 I used chain stitch for the tails, the pattern (Elephants by Laundry Basket Quilts) has fabric tails, but I felt having the tails just hanging straight down made them look a bit miserable, by embroidering them I could make happy, swishy tails. 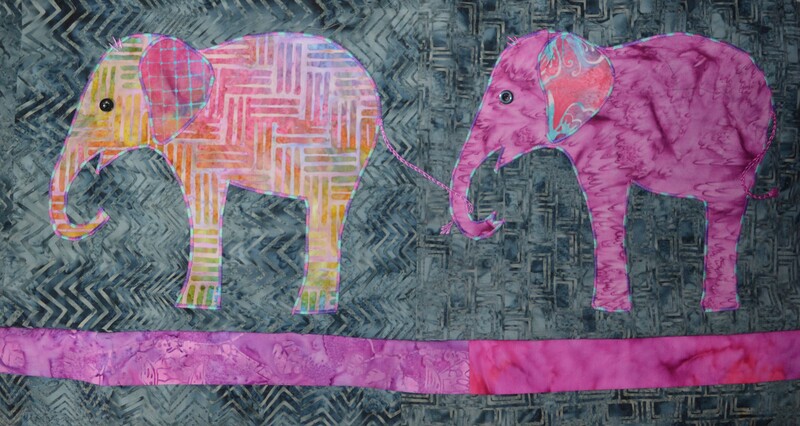 I had quite a bit of fun embroidering the tails, there’s one on each line holding the next one’s tail, some swish upwards, some curl downwards, inwards, outwards….The coloured elephants have tails in co-ordinating colours whereas the grey elephants have either a light or a dark grey tail, which ever would show up best. I spotted some small black buttons on Otley market yesterday, when I said I wanted thirty she did me a deal, so that worked out well! I did debate when to stitch them on as I’m sure they are going to annoy me when I try and quilt near them however I didn’t want black thread showing through to the back and it would have been difficult to avoid it. I stitched them on and with the last stitch I added a tiny silver bead to add a little twinkle in their eyes. The elephants all have three spikes of hair on the top of their heads, just made with a few straight stitches in the same perle thread. I think they look pretty cute! I finally finished all the hand-stitching so I decided to stitch the rows together, planning to buy my backing and batting tomorrow in Skipton. The bottom two rows went together easily. As the stripes inbetween are random lengths I didn’t have any direct seams to match up, this made it easier but also made me lazy with pinning and checking! The third row seemed to be going on fine but when I got to near the end I realised I would be about 2″ short!! I checked a few squares and they were all 11.5″ so I decided it was just tension between the top and the bottom. Out came my friend the stitch ripper. I pinned but it was still out, when I double checked my blocks, one is way out at the top, like 3/4″ out, it doesn’t look like a trapezium but it obviously is!! The pink one is the guilty one, it’s ok at the bottom, just the top edge needs sorting. It shouldn’t be too hard but I want a clear head to sort it out. I’m linking up with Kathy’s Quilts for Slow Stitching Sunday, why not have a look what every one else has been stitching. 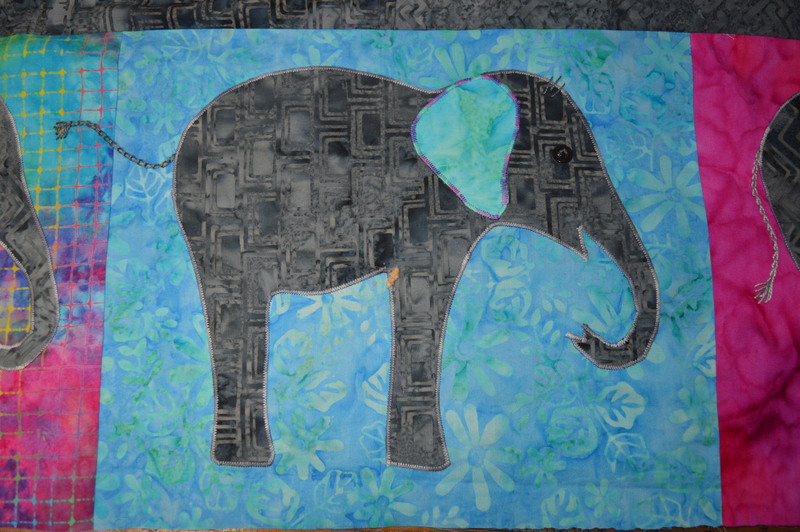 This entry was posted in Quilting, Serendipity and tagged Elelphants, Elephants Quilt, Quilting. Bookmark the permalink. Thanks Kate, I think I’ll be spending some time with my friend the seam ripper! I love the fabric and all the colors! Thanks Christina, Helen wanted a quilt to cheer up her Army accommodation, hopefully this will do it! That quilt will definitely cheer anyone up! That’s very nice of you to make. 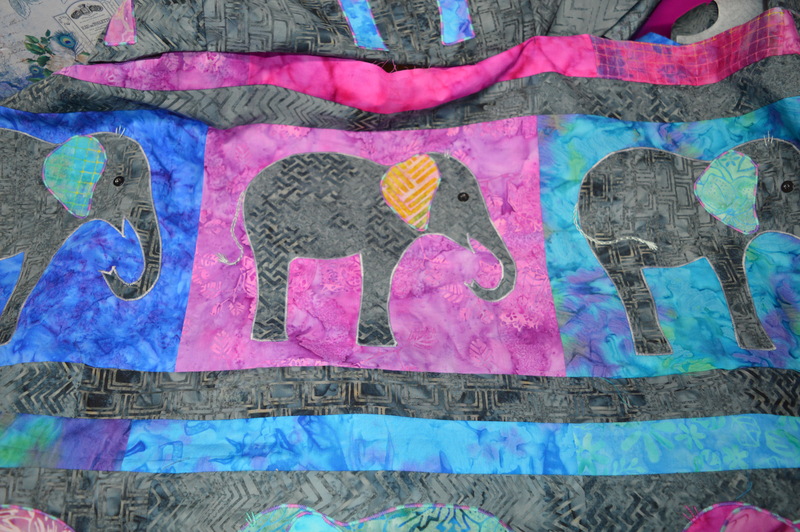 The elephants are really cute, especially the tufts and twinkle! What sweet elephants. I love them made with the batik fabrics. The twinkle in the eye just does it for me! I hate it when I get towards the end of a project and realize that something went wonky way back somewhere! Keeps us humble though, I guess! Sounds like you already have this sorted, just have the actual deed to do! Happy ripping! Thanks Kathy, it was a bit of a lesson in cutting corners !! you’re putting so much love and thought into this quilt, and it shows! It’s looking beautiful. The seam ripper can be your best friend, but I would rather not see her to often 😜 It’s looking great! A little sleep and you’ll get it fixed in no time. Love it – what a stunning combination of fabrics and design!